An antitussive drug having cough suppressant property. An expectorant, used to clear mucus or phelgm from the chest. 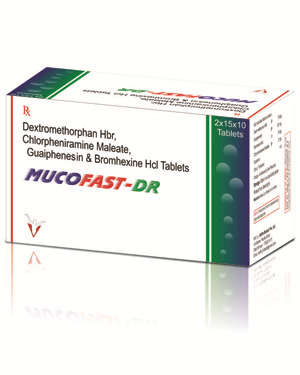 A mucolytic agent used in the treatment of respiratory disorders associated with viscid or excessive mucus. Symptoms includes rash,watery eyes,itchy eyes/nose/throat/skin,cough,runny nose and sneezing. Combination therapy is more effective than monotherapy in the treatment of persistant allergic rhinitis. Combination of drugs is far better in respiratory tract infections than a single drug.